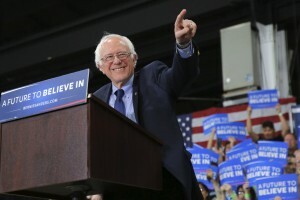 PROVIDENCE, R.I. — Bernie Sanders can thank a patient ferry captain for helping to cement his Democratic presidential primary victory in the sleepy resort community of Block Island. Sanders captured 64 percent of the Democratic vote Tuesday on the remote island that’s a 55-minute boat ride from mainland Rhode Island. But there wouldn’t have been enough ballots for all 308 islanders who cast Democratic ballots were if not for a frenzied mission to get an emergency shipment to Block Island before its sole polling place closed. Town Clerk Molly Fitzgerald panicked at 4 p.m. as she learned there weren’t enough Democratic ballots to last through the night. She had reserved 300 and they were almost gone. That’s when Anne Irons, a clerk in the mainland town of Narragansett, got a call for help. Irons jumped in her car, went to a polling place to find extra ballots, sealed them up and drove them to the ferry dock at the Port of Galilee. Waiting for her was Steve Kimball, the boat’s longtime captain, and the 92 passengers of the day’s last ferry. Kimball held the boat 22 minutes behind its scheduled departure for the shipment to arrive. Rhode Island was the only state of the five that held primaries Tuesday where Sanders beat front-runner Hillary Clinton. Fitzgerald said she wasn’t expecting such a heavy turnout.